Document Storage and Archive Storage Services for companies in Derby, Nottingham, Leicester, Lincoln, Mansfield and the surrounding area. Whitefields Document Storage (WDS) offers affordable yet highly secure document storage and destruction in the East Midlands. Our facility conditions are of a high standard to ensure complete confidentiality and feature a climate controlled environment to preserve your important documents. Our attention to detail is what makes WDS your best choice for safe document storage. Ensure peace of mind with our destruction service and know that your privacy always comes first. Using the highest standard of equipment, we securely destroy all documents that have been given the client’s authorisation for destruction. Our facilities are conveniently located to serve major areas of the East Midlands. The site is easily accessible via the A46 and A52 and is a short distance away from the Bingham Train Station. The Whitefields Document Storage (WDS) site is a short 17 minute drive along the A46 from neighbouring Newark making us a first choice for document storage for Newark businesses. Keep your documents close by and choose our conveniently situated storage facilities. The neighbouring market town of Grantham is only a 20 minute drive away or a short train journey via the regular rail service. We are perfectly situated by the A52 making the journey quick and easy and Whitefields Document Storage (WDS) the perfect document storage solution for Grantham businesses. Our Nottinghamshire location makes Whitefields Document Storage (WDS) the perfect document storage facility for Nottingham City businesses. From the centre take the A60 and the A6011 to the A52 where it’s a short, easy journey to our perfectly located site opposite the town of Bingham. Via the A606 and the A46, the “Rural Capital of Food”, Melton Mowbray is situated just 25 minutes away from Whitefields Document Storage (WDS). Our close location to the town and convenient placement by these main roads means that WDS is the ideal document storage facility for Melton Mowbray businesses. Loughborough’s close location to Whitefields Document Storage (WDS) means that we’re just a quick 25 minute drive away. Jump straight on to the A46 via the B676 and you’ll find us just up the road, conveniently placed next to the A52. We’re perfectly located for the document storage of Loughborough businesses. 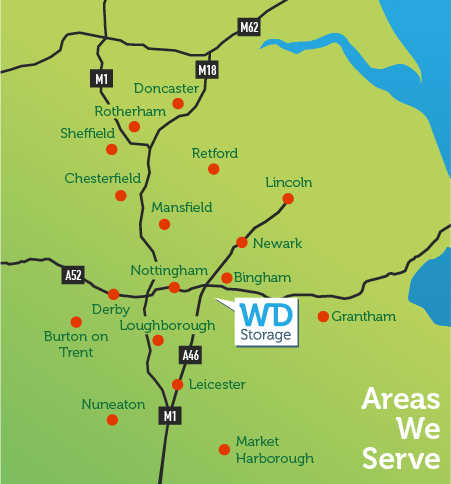 A 35 minute drive away, Whitefields Document Storage (WDS) is easily accessible from Mansfield via the A617 and the A6097. Easily accessible and in a convenient location, WDS is the ultimate choice for Mansfield businesses’ document storage. Our close proximity to the A46 means that journey time from Leicester to the Whitefields Document Storage (WDS) site is a quick 30 minutes. Easy access via train or car means that our document storage facilities are ideal for businesses in the Leicester area. An easy drive straight along the A52, Whitefields Document Storage (WDS) is just 35 minutes away from Derby. We’re placed in a convenient location by the main road to make access from all surrounding areas quick and easy, meaning that WDS is a great choice for document storage for all Derby businesses. Secure and professional document storage and destruction.